At 0439 on the morning of Sunday 13th October, 2013, Guernsey Coastguard received a call from Guernsey Police requesting assistance from the Lifeboat. Two men swimming off Belle Greve Bay on the east coast of “Guernsey” being reported in difficulties. The St Peter Port Lifeboat departed St Peter Port at 0505 and stood by in the area, at 0521 the Lifeboat returned into St Peter Port after the Casualty’s had been helped ashore by the Police and St John’s Ambulance & Rescue Service. The St Peter Port Lifeboat is presently “on- service” to assist a 30` trimaran that has become dis-masted and unable to proceed. 1302 The Lifeboat Crew was called. 1325 “Spirit of Guernsey “ left the Pierheads. 1450 On scene with the casualty. The boat was dis-masted some 25nm South West of Guernsey. 2046 A call was received by mobile phone to Guernsey Coastguard, from two persons, sat on rocks, at the northern extremity of Sark ,( Beq Du Nez). They informed the Coastguard that their boat had been swamped, and that they had managed to swim to the rocks, but two other persons were unaccounted for. This information initiated a substantial search. 2108 The “Spirit of Guernsey”, “Flying Christine III” and “Air Search One” were all tasked to search an area around the north of Sark. It was known that the two persons on the rocks were OK, so the priority was given to search for the two missing persons still unaccounted for. 2135 A call was receive from Brecqhou that they could hear voices at the bottom of the cliff, below Jacobs Landing on the north east coast .Very fortunately, these were the two other people from the swamped boat. They were picked up by a Sark rib and taken to the “Flying Christine” and Lifeboat respectively. The woman`s medical condition worsened, resulting in the “Flying Christine “ being rushed back to St Peter Port, for further Medical attention. The two casualties on the rocks, north Sark, were assisted by the Sark Fire brigade and the Sark Doctor gave them a clean bill of health, they remained in Sark. The Search and Rescue service in Guernsey is very grateful for all their assistance given by all crews to bring this search to a successful conclusion as it could have very easily ended with tragic consequences. At 2017hrs on Tuesday 3rd September 2013, Guernsey Coastguard received a Pan call from the local boat “Tahini” requesting assistance as he was lost in the fog returning from Herm. The Life Boat had just returned from exercise and was launched to assist in finding the casualty; the Lifeboat departed at 2020hrs and found the “Tahini” off the Lower Heads at 2035hrs escorting them back to St Peter Port Harbour arriving at 2057hrs. At 2220hrs on Tuesday 3rd September 2013 Guernsey Coastguard received a call reference the local Rib “Stingher” overdue from a trip back from Herm with one person onboard. The Lifeboat launched at 2320 making a search around Herm & Jethou, at 0221 this morning the Lifeboat found “Stingher” upturned on the Aiguillons Rock (approximately 1/2nm SW of Jethou) with the skipper next to the Rib. The Lifeboat rescued the skipper then returned to St Peter Port Harbour transferring the casualty to St John’s Ambulance and Rescue Service at 0240. At 1512 Guernsey Coastguard received a call from the fishing vessel “Petit Mel” (requesting immediate assistance) taking water with three crew onboard in a position approximately 4nm Northeast of Sark. The “Sark Venture” and “Margaret K” arrived on scene first and stood by the “Petit Mel” until the Life Boat arrived at 1556 with salvage pumps. 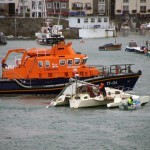 The Lifeboat departed St Peter Port at 1529 and found the “Petit Mel” at 1556, after transferring a salvage pump on board the casualty the Lifeboat then towed the vessel back to St Peter Port harbour arriving at 1755. At 2215 this evening Guernsey Coastguard received a call for assistance from the Polish yacht “Lbigniew Bounski” tangled in fishing gear approximately 6nm South of Guernsey with 8 crew on board. The Lifeboat departed St Peter Port at 2250 and found the “Lbigniew Bounski” at 2320 anchored to the sea bed with fishing gear, the Lifeboat cut the yacht free then towed the casualty back to St Peter Port harbour arriving approximately 0100 Sunday morning. 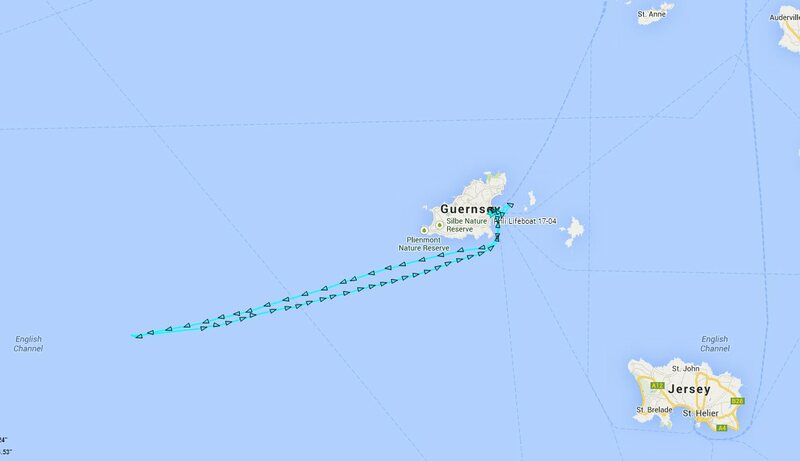 At 19:24 local time, Guernsey Coastguard received a call from the French Rescue Centre, X-Mar of a vessel becalmed with mechanical and electrical problems 40 miles west of Guernsey. As no other vessel was able to assist, the St Peter Port Lifeboat “Spirit of Guernsey” was launched at 20:30 to tow the forty five foot Barnabas with eight crew to Guernsey. 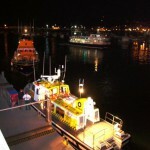 The lifeboat was on scene at 22:40 and back in St Port with the casualty at 04:27.